Yesterday I wrote about the Left-ward momentum in the Massachusetts Democratic party and how it was confounding the party’s ability to pick a best Governor nominee. My story felt incomplete, more notion than news. Today I had in mind to dig deeper; to discuss the tremendous surge of activity going on, outside the Boston area Core, under the rubric of the GOP, that confirms, in the opposite direction, the Democrats’ Leftward momentum story. In short, polarization, as we have come to see it in national politics these past six years and more. It is not a pleasant story. News that discrimination is invading the political scene never is pleasant. But it supports — gives a sad cast to — my own column, today, about the polarization that bids to take over our state’s politics. Perhaps it’s a battle we have to fight. We cannot allow the voices of darkness to gain traction. They have already gained plenty. The charlatan talk show hosts, who say outrageous things to get attention and thus ad dollars, have given discrimination and hate legitimacy — with those who either do not see that they’re being had, or who actually believe that their darkest thoughts should become political policy. I suppose that most of us have road rage moments; but most of us also recognize that such squalls of anger augur no good. So it would be, were it not for the talk show thing. But we now have talk show politics; it is not going away, as I — many of us — used to imagine it would. As the economy continues to struggle; as wages for most of us lag while huge money accrues to the very few; as life becomes more diverse and all of that diversity confronts us via social media, a politics has come of age that rejects a future it feels not a part of; a politics of deep pessimism and profound alienation, politics of naked personal fear. This is the turbine that drives the train of political intensity across Massachusetts’s towns and cities. But the polarization isn’t simply of value judgments. 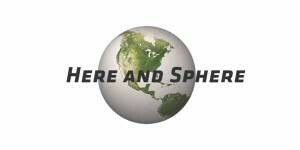 It has a geography. From the outer suburbs of Boston along Route 495 and close inside it and throughout central Massachusetts all the way to the exurbs of Springfield there has arisen a wide swath of towns whose voters reject the politics of the Boston area, reject Boston values, Boston diversity, Boston inclusion and experiment. This circle of towns — maybe 100 in all — is the heartland of the “Tank the Tax’ referendum; of Tea party sentiment; of Republican votes in recent elections. There are towns in this Circle of rejection that gave 20 and 30 point victories to Gabriel Gomez even as he lost last year’s US Senate race to Ed Markey by 10 points. These same towns gave Scott Brown 30 and 40 point victories in his 2010 special election win. And today these towns are generating a large number of Republican candidates for the Beacon Hill legislature — many more such candidates than we’ve usually seen in Massachusetts, with much better funding and a much deeper bench of activist support. This last development makes the polarization story significant. US Senate elections have their own dynamic. 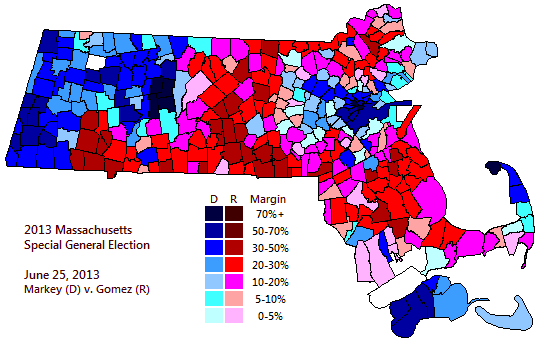 Massachusetts has elected Senators from each party, all the way back to the late 1800s and ever since. But not since the GOP lost majorities in our State legislature some 60 years ago has there been, except in a few upper income places, any kind of Republican activity at the local level. Today almost all of those upper income communities have become Democratic. The most Republican active communities today are middle income, even low income, places : tract house suburbs, low-density exurbs, and sparsely populated rural places. think Billerica, Bellingham, and Tewksbury; Grafton, Mansfield and Whitman; Douglas, Monson, and Charlton. ^ Bush – Kerry in MA, 2004. Note Charlton, in the middle of the map towards the bottom. Charlton — a pass-through stop on Route 20 southwest of Worcester — exemplifies the new, hard right Massachusetts GOP. In 2004, when John Kerry, then our US Senator, was winning 62 % of the Massachusetts vote for President, Charlton gave its 60 % to George Bush. Not that long ago, party divisions in Massachusetts had more to do with ethnic histories and 1920s-1930s Labor radicalism than with city versus rural, diversity against the old way. (And then, the Democratic party was culturally much more conservative than the socially liberal, WASP GOP establishment.) We can mark each step in the change thus : in 1970, Arlington, filled with prosperous Raytheon workers, was a bellwether town — as it voted, so did the State. Today Arlington. an academic community, is a guaranteed 20 to 40 point Democratic victory. By the 1980s, the bellwether vote town was Framingham — farther from boston than Arlington but definitely a commuting place. Today, Framingham votes 15 to 30 points Democratic. Conversely, in the late 1990s, the bellwether community was Peabody, a town filling up with culturally conservative Italians. Today, Peabody gives the GOP a 10 to 20 point victory and has a Republican state legislator, Leah Cole. Today the bellwether city in our state is Waltham : the front line between Boston diversity and old-line factory city passes right through it. Quincy shares much the same mix. Yet these few exceptions aside, there really is no bellwether community today in Massachusetts. Most towns and cities are now all GOP or all Democratic. That is why we see the current surge of GOP activity at the state legislature level. It’s when a community moves from swing voting to being all one thing or all another that low level, neighbor to neighbor elections take on a partisan color. Fortunately for those of us who live by Boston, city values — diversity, inclusion, welcome to immigrants, and government working to serve all the people — the polarization taking shape on both ends claims a clear city values majority. Democrats running state wide can pretty much count on winning by 6 to 20 points. 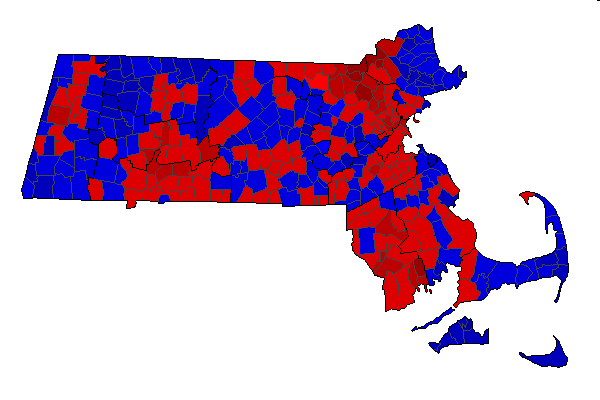 That’s because about 25 % of Massachusetts voters live in the Boston core area — and another 15 % in the academic bastion Connecticut Valley and points West, and these areas (Amherst, Lee, Springfield, Cambridge, Brookline, Dorchester) vote overwhelmingly Democratic : 30 to 70 points ! No Democrat is likely to lose a statewide election with that kind of wind at his or her back. For despite the surge of GOP energy out beyond the City core, its roar represents an interest distinctly minority and one that is dwindling — and knows it. It is fighting a rear guard battle and seems energized to fight to the last man standing. It is Alamo politics : dramatic, fascinating while it is going on, but, in the end, complete defeat. Those of us who move with the blossoming majority — the flowers of tomorrow, no matter the huge challenges looming– can take heart in knowing that Alamo politics do not end with an Alamo victory. And what of the 2014 Governor race ? 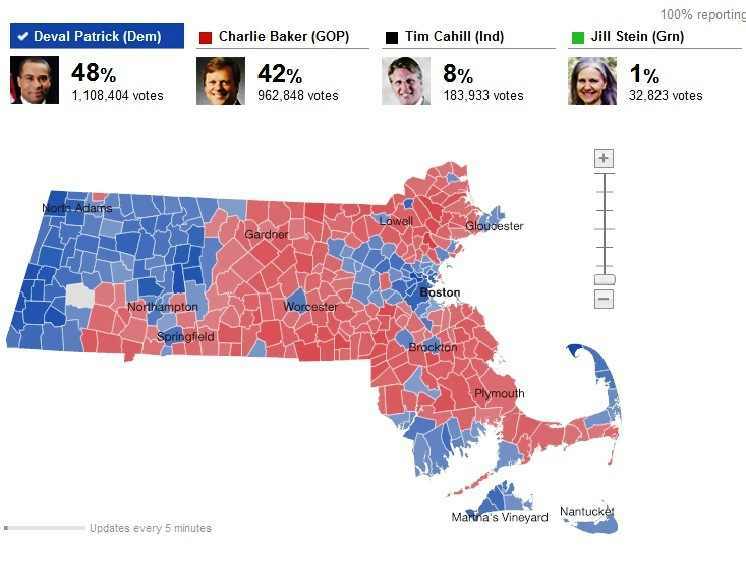 There I predict a Charlie Baker victory. He is running as a city values candidate, has credibility as a city values guy, and almost certainly has the GOP surge vote on his side simply because it dislikes the Democratic tone of voice so profoundly. Though the Democratic party is moving Leftward by the same dynamic that has the GOP moving Right, many more Democrats than Republicans remain pragmatic centrists : because .the Democrats own the legislature and run the State. These Democtrats cannot throw aside their investment in state policy and governance. The most practical team to get things done, that they care about, is Charlie Baker as governor and Robert DeLeo as Speaker — because, ultimately, it is easier for them to stand — loyal Democrats ! — behind a Democratic Speaker as he pacts with a Republican Governor than to find themselves ripped in two directions by constituents here and a Democratic Governor there. These go-along Democrats represent a significant vote, especially in the suburbs that lie between the GOP outer ring and the innermost Boston core. Think Winchester, Salem, Braintree, Norwood, Wilmington, Woburn, Natick. It would seem a paradox to find a centrist progressive like Charlie Baker elected by a state whose politics are polarizing so momentously. But life is complicated, and not every mind moves to the flavor of the moment. Those who take the long view also matter. Previous Post#MAGOV14 : LEFT-WARD ACTIVISM INSPIRES AND CONFOUNDS THE DEMOCRATIC NOMINATIONNext PostTHE SALLY CRAGIN TRI-TOWN REPORT : IS IT FEBRUARY ? IS IT MARCH ? Awesome how you repeatedly pat yourself on the back for your “Boston, city values — diversity, inclusion, welcome to immigrants, and government working to serve all the people”….and in the same piece revel in your own repulsive class-ism: “The most Republican active communities today are middle income, even low income, places: tract house suburbs, low-density exurbs, and scantly populated rural places. think Billerica and Tewksbury; Grafton, Mansfield and Whitman; Douglas, Monson, and Charlton”. PS – I’m an independent with a revulsion for both Democrats & Republicans that usually ends up voting Dem as the lesser of 2 evils.